A question on the new OTN JDeveloper and ADF forum (or space if you like the new name better) inspired this post. The use case is to show a popup each time the user clicks on one of the radiobuttons of a button group. This popup should show an inputText component to let the user enter some text for the selection. After the selection the text is shown on the page under the button group. To make it more interesting, it was not ask for this in the question, the popup should show which radio button was clicked. An additional question on the OTN forum asks how to display the label of the selected radiobutton and not it’s value. I updated the workspace to show how to implement this. Caused by: javax.servlet.jsp.JspException: ADF_FACES-60023:Component: RichSelectItem[UIXFacesBeanImpl, id=si10] does not support client listeners. The solution to the problem is to use a valueChangeListener on the af:selectOneRadio and show the popup from the bean code. Before showing the popup we need to process the value change event to get the selected value in the dialog of the popup. You see that the popup shows the value of the selected radio button as the title and the entered text in the popup is shown as ‘last reason’ below the radio button group. This ‘magic’ is done by simply adding a partial trigger to the outputText component which is listening to the dialog inside the popup. You can download the workspace from the ADF EMG Sample Project BlogTestRadiobutton.zip. The sample uses the HR DB schema (even as this is not really needed for the sample). 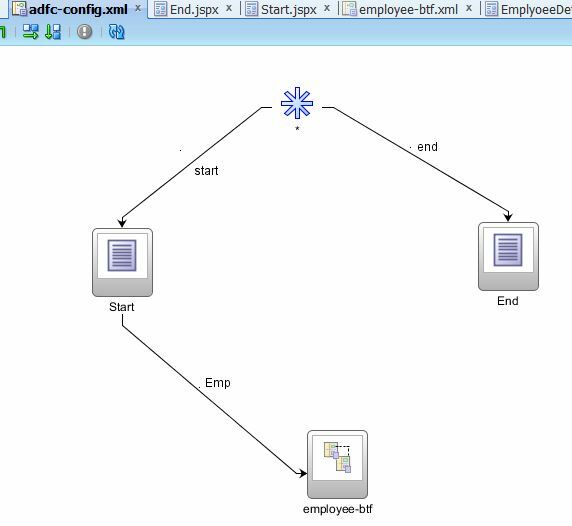 A question on the OTN JDeveloper and ADF ‘Space’ asked for a sample and/or tutorial on how to navigate after a bounded task flow, based on pages, returns from its work. I setup a sample application to show how this works. The application is built using JDeveloper 11.1.1.7.0 and uses the HR DB schema. The sample can be loaded using the link provided at the end of the post. Now that we have seen how the application works let’s check out how it’s implemented. We see that the application is built from two pages, a ‘Start’ page and an ‘End’ page. 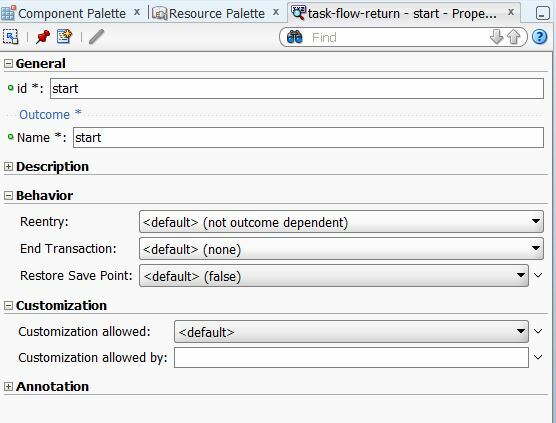 The ‘Start’ page can call a bounded task flow employee-btf. The start page holds one button ‘Start’ which calls the bounded task flow which is shown below. As you see the return for ‘start’ calls a parent navigation ‘start’ which is implemented using a ‘wild card’ navigation ‘*’. Same is true for ‘end’ task flow return call. 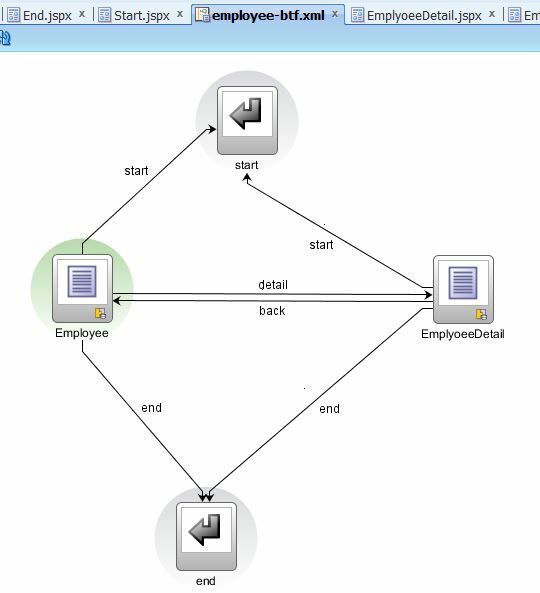 Once the navigation is given back to the parent task flow, it looks for a navigation with the name of the outcome ‘start’ or ‘end’ and executes the navigation. As you may have noticed the long awaited upgrade of the Oracle OTN forum software has taken place over the weekend. I did not know what to expect from the upgrade (second one I gone through), other than the few comments from Sonya Barry in the Community Feedback Forum. Well, in summary it could have been worse. My personal feeling is that it’s too colorful and overloaded. This may however change once we (I) know where to click and look to get what are looking for. Today, the first day the new forum is visible, I had some trouble. The page didn’t load all the times, I could log in but the page did not reflect this, some times the page simply crashed. Now after some time the login problem is solved. We can login and create new threads or answer them. Here, however Oracle need to do some fine tuning. Right now I can’t find out which threads I’m participating. I have tried the e-mail notification, I follow the threads, which I have to do for every thread as I have not found the option ‘follow threads I’m participating’, but I don’t get a notification (mail or in the communications tab). Once I found the list view (thanks to Shay how pointed it out) I’ve got the problem that I can’t jump to the last answer in the thread. I always have to start with the first post and scroll down to the last. This is not a big deal on a PC, but it’s quite an act on a smart phone. Once you go to the next page (‘load more elements or click on the blue arrow beside the page number) in list view you can’t really see which page you are currently on. If you answer a thread there is no ‘back to list of threads’ near the end of the post. You have to scroll back up and click the bread crumb to go back (OK, scroll all the way back up on my smart phone). I’m missing some kind of help feature which helps to understand all the new features and icons which are around. How to use the new editor in an efficient way, format code or quote part of a post (without switching the editor mode)? How to setup some favorite ‘spaces’ which I read frequently? I hope the next few days get us some more info how to best tweak the new software in a way we, the users, like to use it.